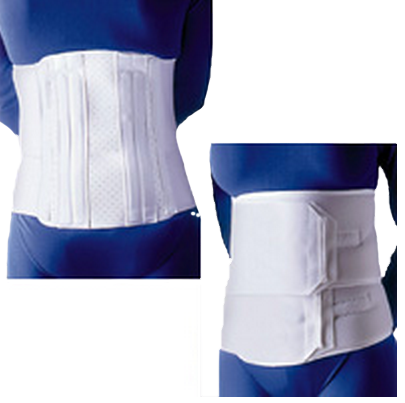 Deluxe Lumbar Support 11 Inch Height, manufactured by FLA Orthopedics, is a lumbar sacral support helps alleviate pain caused from muscle strain by relieving stress on the lower spine. This support is exceptionally strong and durable. Back panel is made of perforated vinyl with a soft cotton lining. Strength is achieved with four contoured rigid stays. Metal stays can be shaped for a customized fit. Double front closures are made of high quality elastic and soft foam. Unique double closure design allows for a contouring fit around waist and hips. For sizing measurements, measure around the fullest part of abdomen. For an alternative lumbar support garment check out the Universal Sacro Lumbar Support or, for a solution more focused on the female form, check out the Lumbar Sacral Support. Lumbar support relieves stress on lower spine.